According to a coding scheme the sentence Peacock is designated as the national bird of India is coded as 5688999 35 1135556678 56 458 13666689 1334 79 13366 This coding scheme has the following rules: 1. The scheme is case-insensitive (does not distinguish between upper case and lower case letters). 2. Each letter has a unique code which is a single digit from among 1,2,3, …, 9. 3. The digit 9 codes two letters, and every other digit codes three letters. 4. The code for a word is constructed by arranging the digits corresponding to its letters in a non-decreasing sequence. Answer these questions on the basis of this information. 1. The scheme is case-insensitive (does not distinguish between upper case and lower case letters). 2. 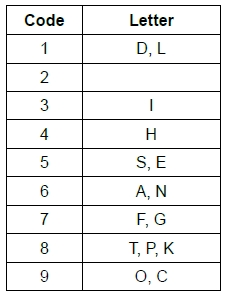 Each letter has a unique code which is a single digit from among 1,2,3, …, 9. 3. The digit 9 codes two letters, and every other digit codes three letters. 4. The code for a word is constructed by arranging the digits corresponding to its letters in a non-decreasing sequence. Answer these questions on the basis of this information. What best can be concluded about the code for the letter L? What best can be concluded about the code for the letter B? For how many digits can the complete list of letters associated with that digit be identified? Which set of letters CANNOT be coded with the same digit? 9 is the code for o and c from the words peacock and of. F is coded as 7 from the word of. I is coded as either 3 or 6 from the word India, but from the word 'is' and 'designated' code for 'I' is 3. S is coded as 5 from the word is. A is coded as 6 from the word 'as'. N is coded as 6 from the word national. Thus D is coded as 1 from the word India. E is coded as 5 from the word designated. T is coded as 8 from the word 'the' and 'National'. Thus H is coded as 4 from the word 'the'. G is coded as 7. L is coded as 1 from the word 'National'. P and K are coded as 8 from the word 'peacock'. B and R are coded as 3 and 4 many order from the word 'bird'. B and R is coded as 3 or 4. S, U, V cannot be coded with same digit.